IBM InfoSphere DataStage is a part of IBM Information Server Suit. DataStage enables us to define the extraction process of data from multiple source systems, transform it in ways that make it more valuable, and then load it to single or multiple target applications. In short it is an Extraction Transformation and Loading (ETL) tool. There is a demand of Datastage course all over the world, especially for the online Datastage training. BigClasses is providing online Datastage training by real time experienced faculty. BigClasses is not only providing Datastage training at Hyderabad, BigClasses is ready to train students around the world. 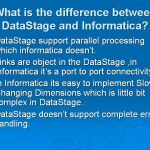 To Learn DataStage Click Here! We are providing class with highly qualified trainer. Each topic coverage with real time solutions. We are providing digital study material. We are providing certificate after completion of the course.